Up to 40% of kids who experience a slipped capital femoral epiphysis (SCFE) in one hip develop a slip in the contralateral hip. Recent research in pediatric orthopaedics has attempted to identify risk factors for a second SCFE in patients who have had a first. A retrospective study by Maranho et al. in the February 6, 2019 issue of JBJS provides additional evidence about one particular risk factor. Increased posterior epiphyseal tilt was associated with an increased risk of contralateral SCFE, which corroborates recent findings. Specifically, an epiphyseal tilt of >10° corresponded to a 54% predicted probability of a contralateral slip in patients with open triradiate cartilage. Increased epiphyseal extension around the metaphysis in the superior plane had a protective effect against a contralateral SCFE. For each 0.01 increase in superior epiphyseal extension ratio, the odds of a contralateral slip decreased by 6%. The alpha angle and epiphyseal angle were not independently associated with a contralateral slip. Clinically, the authors suggest that the tilt findings may be more useful than the extension-ratio findings, especially when it comes to the difficult decision around whether to perform prophylactic percutaneous pinning of the contralateral hip. They write that “prophylactic fixation may be discussed with the families of patients presenting with unilateral SCFE who have a tilt angle of >10°,” noting that this threshold “would result in a low proportion of patients undergoing unnecessary prophylactic pinning.” Maranho et al. are quick to add that even contralateral hips with epiphyseal tilt angles <10° are at risk of SCFE and should be closely monitored. Read the JBJS Clinical Summary on SCFE. Trying to educate elderly patients and their family members about how to best treat a femoral neck fracture can be difficult. These patients typically have multiple—and often severe—medical comorbidities that can make even the most “simple” surgery complex and life-threatening. Making such discussions even harder is the lack of Level-I evidence related to treating these common injuries. For severely displaced fractures, the evidence supports performing either a hemi- or total hip arthroplasty on most patients. But the data is much less clear for minimally or nondisplaced fractures. For these reasons, I was excited to read the study by Dolatowski et al. in the January 16, 2019 issue of JBJS. The authors performed a prospective, randomized controlled trial comparing internal screw fixation to hemiarthroplasty for valgus impacted or nondisplaced femoral neck fractures in >200 patients with a mean age of 83 years. They found that patients who underwent hemiarthroplasty had a significantly faster “up-and-go” test and were significantly less likely to undergo a major reoperation than those who underwent internal fixation. However, patients in the internal-fixation group were less likely to develop pulmonary complications. There were no between-group differences in overall hip function (as evaluated with the Harris hip score) or in the 24-month mortality rate. This study lends support to what many surgeons tell elderly patients with a nondisplaced femoral neck fracture: a hemi- (or total) arthroplasty will probably provide the lowest risk of needing a repeat operation for the injury, while placing percutaneous screws may decrease the risk of cardiopulmonary complications related to the operation. While these findings may not be surprising, this study provides important Level I data that can help us educate patients and their families so that the best treatment for each individual patient can be determined. Bundled Payments for Hip and Knee Replacement: Working as Planned? When Medicare’s Comprehensive Care for Joint Replacement (CJR) program was implemented in 2016, the health care community—especially orthopaedic surgeons— had 2 major concerns. First, would the program actually demonstrate the ability to decrease the costs of total joint replacements while maintaining the same, or improved, outcomes? Second, would CJR promote the unintended consequence of participating hospitals and surgeons ”cherry picking” lower-risk patients and steering clear of higher-risk (and presumably higher cost) patients? Both of these questions were at the heart of the study by Barnett et al. in a recent issue of the New England Journal of Medicine. The authors evaluated hip and knee replacements at 75 metropolitan centers that were mandated to participate in the CJR program and compared the costs, complication rates, and patient demographics to similar procedures at 121 control centers that did not participate in CJR. The authors found significantly greater decreases in institutional spending per joint-replacement episode in institutions participating in the CJR compared to those that did not. Most of these savings appeared to come from CJR-participating institutions sending fewer patients to post-acute care facilities after surgery. Furthermore, the authors did not find differences between centers participating in the CJR and control centers in terms of composite complication rate or the percentage of procedures that were performed on high-risk patients. While this 2-year evaluation does not provide the level of detail necessary to make far-reaching conclusions, it does address two of the biggest concerns related to CJR implementation from a health-systems perspective. There may be individual CJR-participating centers that are not saving Medicare money or that are cherry picking lower-risk patients, but overall the program appears to be doing what it set out to do—successfully motivating participating hospitals and healthcare facilities to look critically at what they can do to decrease the costs of a joint-replacement episode while simultaneously maintaining a high level of patient care. The Trump administration shifted CJR to a partly voluntary model in March 2018, and I hope policymakers consider these findings if further changes to the CJR model are planned. Periprosthetic joint infections (PJIs) create a significant burden for patients, surgeons, and healthcare systems. That is why so much research has gone into how best to optimize certain patients preoperatively—such as those with obesity, diabetes, or kidney disease—to decrease the risk of these potentially catastrophic complications. Still, it is not always possible or feasible to optimize every “high-risk” patient who would benefit from a total hip or knee replacement, and therefore many such patients undergo surgery with an increased risk of infection. In such cases, surgeons need additional strategies to decrease PJI risk. In the December 19, 2018 issue of JBJS, Inabathula et al. investigate whether providing high-risk total joint arthroplasty (TJA) patients with extended postoperative oral antibiotics decreased the risk of PJI within the first 90 days after surgery. In their retrospective cohort study, the authors examined >2,100 total hip and knee replacements performed at a single suburban academic hospital. The patients in 68% of these cases had at least one risk factor for infection. Among those high-risk patients, about half received 7 days of an oral postoperative antibiotic, while the others received only the standard 24 hours of postoperative intravenous (IV) antibiotics. Relative to those who received IV antibiotics only, those who received extended oral antibiotics experienced an 81% reduction in infection for total knee arthroplasties and a 74% reduction in infection for total hip arthroplasties. I was stunned by such large reductions in infection rates obtained simply by adding an oral antibiotic twice a day for 7 days. Most arthroplasty surgeons go to great lengths to decrease the risk of joint infection by percentages much less than that. While further investigations are needed and legitimate concerns exist regarding the propagation of antimicrobial-resistant organisms from medical antibiotic misuse, these data are very exciting. I agree with Monti Khatod, MD, who, in his commentary on this study, says that “care pathways that aim to improve modifiable risk factors should not be seen as obsolete based on the findings of this paper.” Furthermore, the study itself is at risk for treatment and selection biases that could greatly influence its outcomes. Nevertheless, getting a successful result in these patients is challenging and, if validated with further data, this research may help surgeons obtain better outcomes when treating high-risk patients in need of hip or knee replacements. Current guidelines recommend serum erythrocyte sedimentation rate (ESR) and C-reactive protein (CRP) as the first-line testing for evaluation of suspected periprosthetic joint infection, in addition to synovial white blood-cell (WBC) count and polymorphonuclear percentage. However, the sensitivity and other diagnostic measures of these tests and the influence of organisms on these inflammatory markers remain inadequately investigated. Will New Payment Models Adversely Affect Medicaid Patient Access to THA? Concerns have arisen that the implementation of value-based, alternative payment models pegged to “bundled” episodes of care and/or patient outcomes may make it harder for a subset of patients to access the care they need. Specifically, some surgeons may be apprehensive to treat patients who have substantial medical comorbidities or socioeconomic situations that increase their risk of postsurgical complications and poor outcomes, because these alternative payment models often financially penalize physicians and hospitals for the cost of suboptimal results. The study by Shau et al. in the December 5, 2018 issue of The Journal provides data that sharpens the horns of this dilemma. The authors used the National Readmissions Database to perform a propensity-score-matched comparison between >5,300 patients with Medicaid payer status who underwent a primary total hip arthroplasty (THA) and an equal number of patients with other types of insurance who also underwent primary THA. Shau et al. found that Medicaid-covered THA patients had significantly increased overall readmission rates (28.8% vs 21%, p <0.001, relative risk=1.37), mean length of stay (4.5 vs 3.3 days, p <0.0001), and mean total cost of care ($71,110 vs $65,309, p <0.0001), relative to the other group. These results strongly suggest that Medicaid payer status is an independent factor associated with increased resource utilization after total hip arthroplasty. These findings can be viewed from a couple of different perspectives. First, from a preventive standpoint, surgeons and healthcare systems providing THA for Medicaid patients may need to spend more time preoperatively optimizing these patients (both physically and psychosocially) to decrease their postoperative resource burden and increase the likelihood of a good clinical outcome. Second, these results are further proof that any fair and effective alternative payment model needs to take into consideration factors such as Medicaid payer status and patient comorbidities. If they do not, such models will actually throw access barriers in front of patients in this demographic because providers may feel that caring for them increases the likelihood of being penalized financially. Both perspectives are valid, so Medicaid payer status is a crucial factor to consider as alternative payment programs move forward. Nowadays, controlling costs is an important goal of any healthcare delivery system, but it must not lead to unintended discrimination in patient access to care. As we create further alternative payment models and refine existing ones, we must be careful not to prioritize cost cutting ahead of equitable patient access. 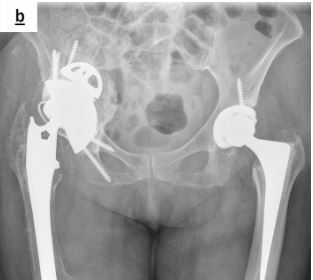 Revision total hip arthroplasty (THA) is a challenging procedure for many reasons, not the least of which is the risk of aseptic loosening leading to re-revision, especially in patients with severe acetabular defects. Acetabular components made of porous tantalum have a developed a good reputation for lower rates of re-revision, relative to components made of other materials. In the November 21, 2018 issue of The Journal of Bone & Joint Surgery, Solomon et al. bolster the evidence base regarding the success of porous tantalum acetabular components in revision THA. The authors conducted a single-center prospective cohort study that used radiostereometric analysis (RSA) to accurately measure acetabular component migration in 55 revision THAs that involved a porous tantalum acetabular component. Over a mean follow-up of 4 years, 48 of the 55 components migrated <1 mm, the threshold that, based on previous findings in the literature, the authors defined as predicting later loosening. Five of the 7 components that exceeded the threshold were re-revised for loosening related to patient symptoms. The RSA data for the 5 components that required re-revision revealed large proximal translations and sagittal rotations that increased over time until re-revision, although the RSA readings revealed that the majority of the migration occurred in the first 6 weeks. Among the components that did not exceed the 1 mm threshold for migration at 2 years, none have been subsequently re-revised for loosening. Porous tantalum acetabular components really do perform well in revision THA. When indicated, inferior screw fixation lowers the risk of component migration. Early component migration is a good predictor of long-term component survivorship. Fracture liaison services and similar coordinated, multidisciplinary fragility-fracture reduction programs for patients with osteoporosis work (see related OrthoBuzz posts), but until now, the data corroborating that have come from either academic medical centers or large integrated health care systems. The November 7, 2018 issue of The Journal of Bone and Joint Surgery presents solid evidence from a retrospective cohort study that a private orthopaedic practice-based osteoporosis management service (OP MS) also successfully reduces the risk of subsequent fragility fractures in older patients who have already sustained one. Sietsema et al. collected fee-for-service Medicare data for Michigan residents who had any fracture from April 1, 2010 to September 30, 2014 (mean age of 75 years). From that data, they compared outcomes for patients who received nurse-practitioner-led OP MS care from a single-specialty private orthopaedic practice within 90 days of the first fracture to outcomes among a propensity-score-matched cohort of similar patients who did not receive OP MS care. There were >1,300 patients in each cohort, and both groups were followed for an average of 2 years. The private practice’s OP MS services incorporated the multidisciplinary protocols promulgated by the American Orthopaedic Association’s “Own the Bone” program. The cohort exposed to OP MS had a longer median time to subsequent fracture (998 versus 743 days), a lower incidence rate of any subsequent fracture (300 versus 381 fractures per 1,000 person-years), and higher incidence rates of osteoporosis medication prescriptions filled (159 versus 90 per 1,000 person-years). Over the first 12 months of the follow-up period, total medical costs did not differ significantly between the 2 cohorts. In 2015, JBJS launched an “article exchange” collaboration with the Journal of Orthopaedic & Sports Physical Therapy (JOSPT) to support multidisciplinary integration, continuity of care, and excellent patient outcomes in orthopaedics and sports medicine. There have been concerns that the antifibrinolytic drug tranexamic acid (TXA) might increase the postoperative risk of cardiovascular events. Our objective was to determine whether perioperative TXA use is associated with cardiovascular events and death within 30 days after primary total hip arthroplasty (THA).